Laminate Loading Dock Bumpers provide the optimal protection needed for any delivery dock, building, or cargo area. Made from recycled truck tires, laminated between structural steel angles, it's exactly what you need for to absorb over 80% of the impact shock. Comes in 29 different sizes and weights to suite your exact application. Overlap angles are available for an additional charge. No assembly required Weather resistant. Made from 80% recycled material (fabric reinforced rubber pads cut from selected recycled tires). 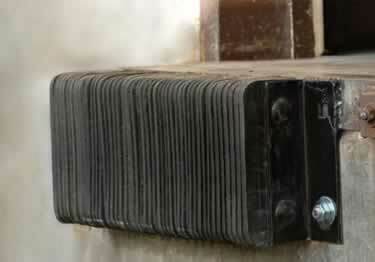 Rubber pads laminated between structural steel angles and secured with 3/4' steel tie rods. The architectural look is given by the deep Black color. Chipping and abrasion is eliminated by the tough piles of truck tire material. Optional plates for weld-on installations (mention in comment area in order information). Loading dock bumpers for factories, warehouses and docks, perfect for unusual anchoring conditions. Rub rails at the sides to protect truck wells.